Many Americans have clutter in their homes. Clutter takes a toll on your life. Accumulating too much stuff scrambles your mind and heats up your anxiety. Whittling down all your belongings may seem overwhelming, but here are some home tidiness habits that are super easy to do, and that will help you feel more relaxed and get organized. Perhaps the first step in the organization process is to be aware of the mental health condition associated with clutter, hoarding disorder, which afflicts an estimated 2 to 6 percent of the population. Hoarders tend to be older males aged between 55 and 94 years. Some of the consequences of hoarding disorder include creating fire hazards, health code violations, and sites where slips and falls can easily occur – to say nothing of the damage it has on your relationships and quality of life. Even if you don’t have hoarding disorder – but like the rest of us, you domake messes on occasion – be mindful of how much better you feel when your home isn’t crammed with every trinket of your past. Just as hoarding is chaotic, throwing out things you don’t need is therapeutic. Getting rid of old clothes, chipped mugs, or ancient yearbooks helps you let go of the past and embrace the future. Psychologists have even found that pitching your junk improves your sleep, invigorates your creativity, helps you concentrate, and makes you happier overall. Use a critical eye and take a look at your belongings. Anything that you don’t have a specific need or desire to keep should be donated, recycled or trashed. If there are leftover items that you don’t want but can’t get rid of yet – say, your great grandmother’s vintage chaise lounge that you promised to your out-of-state daughter – at least keep it from cluttering up your home by putting it in a storage unit. In Loganville, Georgia, the price of a monthly rental has only been about $101.84 over the last six months, which is a small price to pay for getting your home organized and clutter free. Decluttering doesn’t simply come down to discarding the cardboard boxes piled up in the attic, either. Erase all the apps on your iPhone you don’t use. Cut ties on all the toxic relationships you have. Dredge your car of all the motor oil cans and office papers that keep piling up in it. Confronting all the disarray around you will give you a better sense of control over your life. Don’t think of “decluttering” as a grand phase that you go through once a year. To maintain a tidy home, adopt the right habits so you keep the mess down as it tries to rise around you. That means not neglecting the little stuff. Start every morning by making your bed. Completing one task will lead to doing other tasks, too, which might include cleaning dishes as you cook, prioritizing your to-do list, finishing one load of laundry a day, and never leaving a room empty-handed. The last step in creating a more relaxing environment is to consider putting plants or scent diffusers around you and your home. People caught up in the nine-to-five rush of city life often forget it, but being around nature of any sort is great for your health. If nothing else, the beauty of plants can be, for many, a sanctuary unto itself. 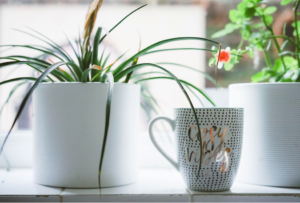 According to studies, researchers have found that houseplants boost your productivity by as much as 15 percent. Plus, they sharpen your focus, boost your mood, and lower your stress. They also work in tandem with aroma diffusers, which purify the air and aid your respiratory health. You can buy an aroma diffuser for as little as $20. “Clean your room,” your parents always told you. It turns out they had a point. To keep a tidy home, you don’t have to color-code your closet or alphabetize your bookshelves. Just abide by another phrase your parents might have said: “A place for everything, and everything in its place.” And if it doesn’t have a place, throw it out. Thanks to our guest blogger, Alice Robertson. For more articles or info from her, check out http://tidyhome.info/!